Polyneuropathy means “many abnormalities of the nervous system”. Early literature on the subject is by Dr. Lars Moe from Norway where numerous cases were diagnosed in the first generation offspring of Alaskan Malamutes imported from the United States in the 1970s. Veterinary colleges in the U.S. have seen a number of cases since then. The condition is generally characterized by a lack of coordination and instability that leads to a labored gate which has been described as a bunny hopping gait where the rear legs work together to prop up the dog rather than to propel him. The degree of affection may vary from mild to severe. The dog may fall down, walk on the tops of his feet (with the foot folded under itself) or his gait may just look a little off. Exercise intolerance, loss of muscle mass, changes in voice due to an affected larynx and problems swallowing and regurgitating have also been described. First indications may be subtle; a dog that no longer jumps up on is house, a dog that lies down to eat, a dog who no longer jumps up and down at feeding time or shows a slight tremor in his legs. It cannot be emphasized enough that symptoms may vary considerably from dog to dog. Age of onset is generally in the older puppy or young adult–six months to two years of age seems to be a good ball park figure with most cases noticed at over a year of age. In the dogs we have seen, the onset was quite sudden rather than gradual and progressive. Several people have reported that their dogs always appeared “uncoordinated”, while some dogs ran in harness for a winter before showing any symptoms. 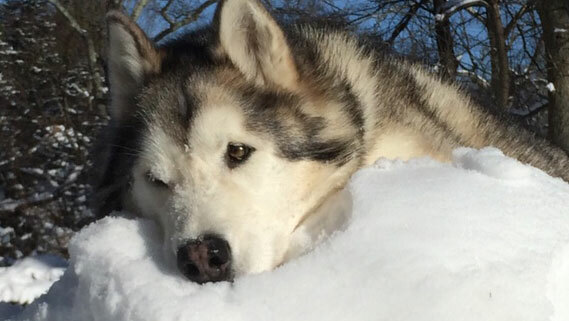 There has been no effective treatment reported for malamute polyneuropathy, but some dogs do appear to “grow out of it”, while others are so severely affected as to require euthanasia. There has been no effective treatment reported for malamute polyneuropathy, but some dogs do appear to “grow out of it”, while others are so severely affected as to require euthanasia. Symptoms may last for six to eight months then abruptly lessen but not go away completely. Because the disease is seemingly rare it may often be misdiagnosed or undiagnosed. There are some other spinal or neurological problems that may cause similar symptoms. Until Autumn of 2011, the only way to definitively diagnose polyneuropathy in the Malamute was through extensive and expensive nerve and muscle biopsies. The neurological diagnostic tests include nerve and muscle biopsies, electromyography and nerve conduction velocities. If results are positive, test will show a deterioration of the myelin sheath of the nerve and conductivity may be slower than normal. They may also do x-rays to see if there is an enlarged esophagus. Essentially what is happening is that the nerve impulses are not getting messages to the dogs’ extremities. Early pedigree analysis indicated that this was likely caused by a recessive gene. Like dwarfism in Malamutes, both parents had to be carriers to produce an affected offspring. The only way to manage this disease was to avoid breeding dogs closely related to an affected dog; especially the parents or siblings of the affected dog. In 2011, Dr. Merete Fredholm announced that the Scandinavian Polyneuropathy Research Group (headed by researchers in Norway, Denmark, and Sweden) had identified the gene responsible for this disease and that testing for it would commence in 2012. The DNA research has confirmed that this disease is caused by a simple recessive gene and so has to be passed down by both parents to produce an affected dog. So in cases where a dog is confirmed affected with polyneuropathy, both parents are carriers of the gene causing disease and siblings have a high probability of being either affected with or carriers of the gene. The DNA test is expected to be available to Malamute owners and fanciers sometime in the spring/summer of 2012. The test will either clear the dog, determine its carrier status or be used to diagnose the disease in an affected dog without putting the dog through a lot of very expensive and invasive tests. What will this mean for owners of Alaskan Malamutes? This will be a real breakthrough for our breed that will enable us to manage a genetic disease without test breeding and without eliminating some good dogs from the gene pool. It will mean different things for different people. If it turns out you have a carrier in your kennel you will be able to breed to a known clear dog and be assured that you will not produce affected offspring. It means that puppies with a carrier parent can be tested at a very young age and go to their new homes with the breeder and buyer knowing if they are clear or carriers. It will provide a critically important tool to ensure that no more dogs need to be affected with this debilitating and deadly disease. We will be providing links to and further information on the DNA testing service as soon as they are available.